Today, I made my way back to my site at Centennial Woods. Since last time, the temperature has been consistently colder, we’ve had a few days of rain, and last Sunday night we had a massive wind storm with really fast and strong winds. 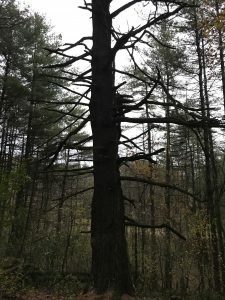 Once I entered the woods, my walk looked and felt very different from last time. There were many broken branches and trees that got knocked over from the wind storm, and less leaves on the trees, so the path felt more open and exposed to the sky. At my place, there were many broken branches strewn across the ground, as a result of the strong, heavy winds. Most were fairly small, but there were a couple of very large branches that got knocked down, making it feel quite different from last time I visited. 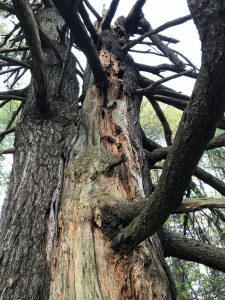 The large Eastern White Pine looked different, as there were large, broken branches caught and laying on other ones up in the tree, as I photographed. The leaves on the trees are now almost entirely gone, as only a couple of the young maple trees had approximately 20% of their leaves left. 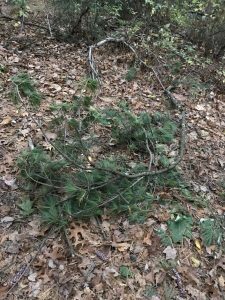 As a result of this, the ground is completely covered in leaves, twigs, pinecones, and small branches. 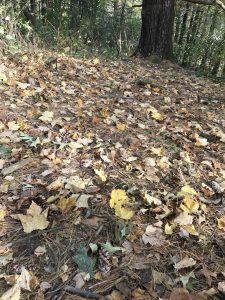 Compared to last time, there is a much higher proportion of red and white oak leaves on the ground compared to last time. The woods are also more quiet than last time. I can hear the underlying noise of crickets, but only heard birds calling and chirping a few times while out there. However, I heard and saw more squirrels than last time. 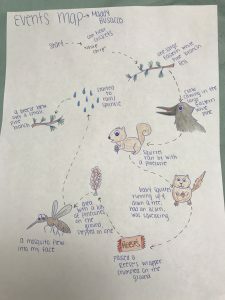 A squirrel with a pinecone ran by me, and I saw a baby squirrel scurrying up and down a pine tree, all while squeaking and barking, which I assumed was in part because I was there and potentially scaring it. Today, I ventured back out into Centennial Woods, and followed the well-worn path back to my place. While still completely recognizable, it is obvious that many changes have occurred since my last visit in early October. Although the temperature today is uncharacteristically warm for the end of October, being a sunny and warm 75-degree day, cooler days and chilly nights have become a recent trend, and the foliage is well representative of that. 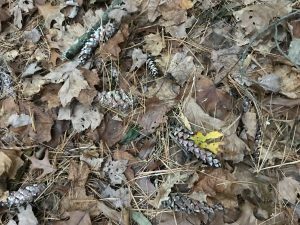 The ground is now almost completely covered in Eastern Hemlock needles, large, sappy pine cones, and an array of mostly golden yellow maple and oak leaves. Similarly, the leaves on all the surrounding trees have replaced their once-green color with that of yellow and hints of red, and the quantity of leaves on the deciduous trees has greatly begun to diminish, as they’ve lost around 40 percent of their leaves thus far. Furthermore, there is evidence of wildlife all around me. In fact, the longer I sit here with only the clacking of my keyboard keys making noise, the more aware I become of the wildlife. I can hear crickets and other insects chirping, the occasional bird call, and one very vocal crow who’s cawing off to my left. 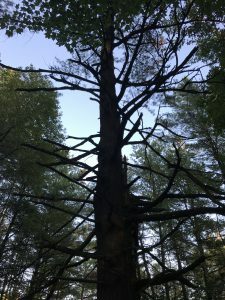 As I sit looking down the sloped land, I can see small bugs, such as ants and ladybugs, crawling in the dirt and on the trees, woodpecker holes in the Eastern Hemlock, a large bird’s nest located high up in the Sugar Maple tree farthest to the right from the log I’m sitting on, as well as one in a hemlock further down. 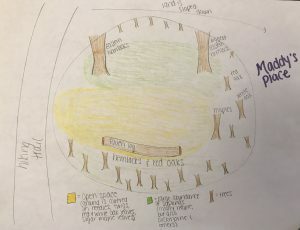 All of this makes it clear that there is a lot of wildlife in my Centennial Woods Place, and that many changes have occurred since my last visit. My place is located in Centennial Woods, and is very easy to get to. 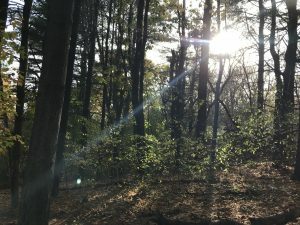 All you have to do is go to the main entrance, with the Centennial Woods sign, and walk through the heavily worn trail, duck under the fallen tree, continue down the hill a little ways, and when you see the first clearing off to the right, which is sloped, you’ve reached the right place. I had chosen this location because I liked that it had a mixture of some open space as well as more heavily wooded areas all in one spot, and, not going to lie, I figured it would be nice to have a relatively quick commuting time to my place when it is cold out. More importantly, I found the area to be extremely calming, peaceful, and relaxing, and it even had a log that served me well as a bench, and I pictured myself there often. 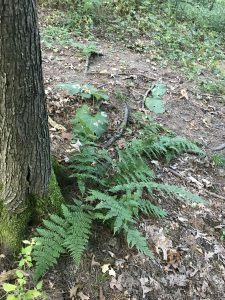 In my place, there are some ferns and maple saplings growing, although much of the ground is left barren or covered in fallen leaves from red oaks and the occasional maple. 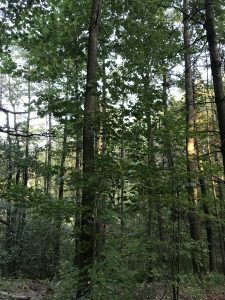 Most of the trees appear to be Sugar Maples and Eastern White Pines, some of which are dead, and there are also a couple of Northern Red Oaks.